Carlos* came to Catholic Immigration Legal Services (CILS) with a serious mental health diagnosis and resulting addiction challenges that he had been experiencing for over 15 years. A private attorney had referred Carlos to CCS for assistance. “Catholic Immigration Legal Services takes on clients with a lot of barriers that other agencies turn down. We really care about people. Easy going people are easy to give compassion to but we work hard to make sure that every client is treated with compassion,” says Tanya Fekri the Immigration Staff Attorney at CCS. 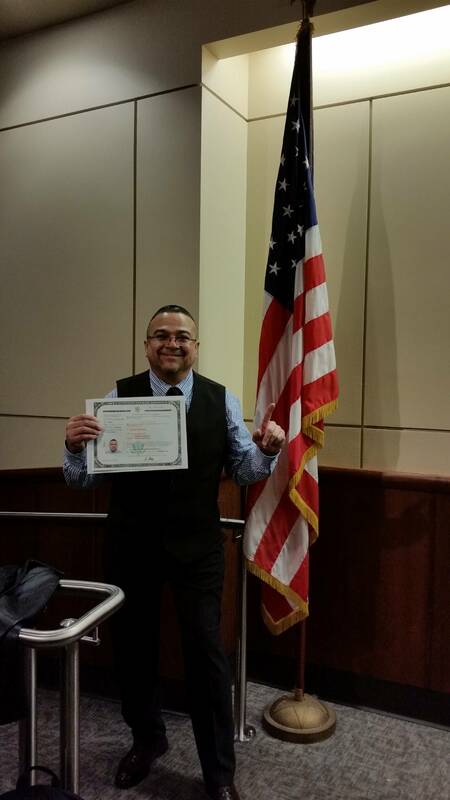 Carlos was eligible for both the medical waiver and language exemption but instead chose to attend citizenship classes and insisted on answering the interview questions in English. When the time arrived for his interview, Tanya attended the citizenship interview in support of Carlos and he answered all the questions correctly. However, the United States citizenship and Immigration Services Officer required additional information and imposed a thirty-day deadline. CILS staff and interns worked diligently to research, obtain out-of-state records and expedite them to the appropriate agencies within the deadline. Shortly after, CILS received the letter for the oath ceremony. With no family in the area, Tanya attended the ceremony with Carlos. She told Carlos that she was “on this journey with you and will see it to the end.” Since becoming a U.S. Citizen, Carlos has registered to vote, moved from CCS transitional housing to his own apartment and found a higher paying job. Catholic Immigration Legal Services (CILS) is committed to serving the immigrant and refugee community, and works to ensure that their legal and human rights are protected as they navigate through the complex immigration system. Click here to learn more and to support this program.